One of the most infuriating things about modern smartphones (and, more specifically, the apps that you download to them) is their constant need for love and attention by way of an endless stream of updates. It’s not really a problem the G20 leaders are keeping themselves awake at night thinking about but those little icons drive me insane (and I am fully aware some phones allow apps to automatically update but I refuse to engage in that whole ‘best smartphone platform’ nonsense). So, yesterday I went through another round of updates. 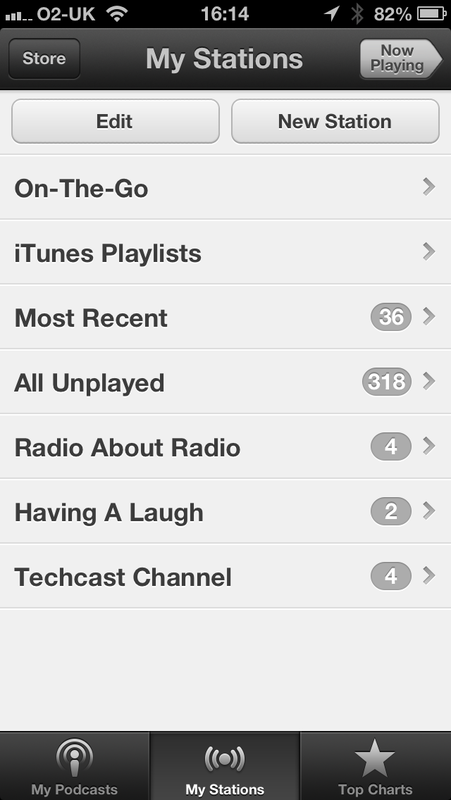 Rarely do I pay attention to the ‘release notes’ given that the usual excuse for consuming the bandwidth is ‘bug fixes’ but, for some reason, I did when it came to Apple’s Podcast app. 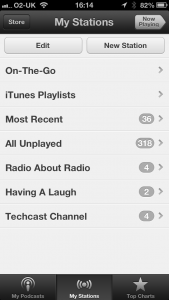 Apple more-or-less created mass market demand for podcasts in 2005 by including them in iTunes but, in recent years, the format has appeared to have lacked much attention from them; on i-devices they were spun out of iTunes into their own app a little while ago. which is accompanied by a lovely image of the ‘My Stations’ screen in the app showing ‘stations’ named ‘Morning Commute’, ‘Kids Shows’ and ‘News’ amongst others (the image here is of my phone, with three customised stations). Six-or-so months ago I wrote a piece called “It’s My Radio Station” which suggested that, at some future point, I would become my own programme controller by setting some basic rules in an app that mixed music and speech to create a customised radio station (which is wholly different from a customised music stream). I genuinely didn’t think it fanciful then and I think it’s even less so now. Imagine the next iteration of Apple’s app where I can mix an iTunes playlist (from my machine or their rumoured streaming service) with this functionality. I believe that any radio station with ‘talent’ that is not getting that content out in alternative ways, including some form of regularly updated podcasts (long and short versions), is missing out on a market. More importantly, they’re missing out on an opportunity to learn about how radio will be consumed in the future. Personalised radio is coming (just as personalised news is already here). I don’t think Apple’s use of the word ‘stations’ can be dismissed but it remains to be seen if it indicates a direction they’re prepared to take. Nonetheless, it could be either new players in the radio space – or an existing broadcaster – who will get there first. Three things fascinate me about how this plays out. Firstly, will a broadcaster be prepared to take a risk on this kind of development or will it need to come from outside broadcast groups to truly allow people to mix-and-match the content they want? Secondly, given it’s proven people like to time-shift television, is radio content sufficiently compelling and/or useful to put the time-shift effort in? And, thirdly, can audio producers generate a revenue from such personalisation? Time will tell. But we’re going to rapidly see innovation on this space. I wonder who’ll get left behind? I opened a dictionary today (by which I mean a paper book). I haven’t done that in a while (no sarcastic comments about spelling, please). I wanted to see what the definition of ‘news’ was and if it was substantially different from that currently published online by Oxford Dictionaries1. It’s not. I think it was pretty similar 20+ years ago when I was a student (and probably the same when the term was first used in late Middle English). Of course it’s got a bunch of modern associations taken from the world around us: we’re all used to it being presented as ‘today’s top stories’. Is it what Alastair Hetherington determined it was when he edited The Guradian or William Rees-Mogg when he did the same at The Times? Is it what Tom Bradby or Laura Kuenssberg think is news at ITV? Or what Nick Sutton thinks is news on Radio 4’s The World At One? Of course. But it’s much, much more. There’s a lot of information that’s newly received or noteworthy about recent events that doesn’t cross James Stephenson’s (editor, BBC TV News at 6 and 10) desk. By this definition there’s more ‘news’ than can fit into any existing bulletin, so for the most of the last 311 years (since 1702 when The Daily Courant launched as Britain’s first regular daily newspaper)2 we’ve relied on news editors to determine a priority and pass this information to us via the press, radio or television (yes, I am leaving the town crier out of this discussion). and is surprised by the silence he is met with. I too was surprised, not by the silence, but the fact that most of the commenters on the piece tend to agree with him and think it’s pretty bad students are not interested in ‘the news’. Of course they are interested in ‘the news’. Just not ‘the news’ if it’s narrowly defined as the list of stories on the radio, on television or in the press. So, to me, the silence is not surprising at all because most of the time there are no ‘big national news stories of the day’ that are common to us all (of course, I will concede, there might be exceptions). This is because most of the students he’s addressing have grown up in a world where you create your own news agenda. News no longer needs to be the prioritised list of events from an unknown (except by byline) editor at my local newspaper or radio station nor what Radios 1-6 think nor anything broadcast by a rolling-news television station. Today, across the world, we create our own news running order from Twitter or Facebook or a million other online tools. It’s continuous stream of stories that mixes the global with the hyper-local and the personal. which is, of course, not what I am saying at all. But I am saying no-one needs to be beholden to a far off editor to prioritise what’s important news to them. It may be a breaking world story, an interesting piece about the industry I work in or news of a new birth in the family. I think asking journalism students to name recent stories might show they can read/watch/listen but means we’re training (and hiring) people for a way of working that’s stuck in a 300-year-old history of doing things that’s not fit for presenting the news in the future. The news bulletin is now mine and I determine the running order. Here’s what I wrote and you can read it in context at News – who cares? For more-or-less twenty years almost all digital news outlets have offered some kind of news personalisation services whereby I can opt to see news that interests me. There’s a whole generation who have grown up with the ability to determine their own news agendas and not a prioritised list of items from an editor in another city. On most days, do ‘the big national news stories of the day’ really still exist? Isn’t it ‘my big stories of the day’ from a wide range of sources? Twitter is just the latest incarnation of news. Certainly there are lots of issues with the bias of self-selection but they’re only a new take on age-old editorial bias concerns. Far from making us ‘dumber’ aren’t Twitter and Facebook The News for some people? If I’ve opted to prioritise Formula 1 news or tech stories from Silicon Valley over today’s political posturing over the ECHR (which is front page on the newspaper next to me)3 then I’ve made a decision that’s no different from the editor that decided to pop that story in the paper. Isn’t Facebook’s timeline just news from my ‘community’ (which is what the news was for most people prior to rise of the mass national press in the late 1700s)? I think if a copy of Metro on the campus of University of Central Lancashire was leading with the Boris/Ken story for the race to be London Mayor then you have your answer as to why students go elsewhere for more relevant news. Perhaps better questions for your students or job candidates might be what are their news agendas for the day? I bet you’ll find articulate people fully aware of news (just different from your definition of news) and thoughts on alternative ways to package that news to make it relevant. If they can’t name Tim Farron (he’s on page 4 of my paper)4 then the internet exists if it becomes necessary. I see a bleak future for newsrooms that persist with the one-size fits all agenda whereby one person’s idea of the top stories should be the same as mine. 1.My dictionary (the paper one) is twenty years old. I was checking to see if the definition had changed in any way. 2. It’s a somewhat arbitrary date to pick as the point where news agendas are set by remote people/editors. But I felt the first regular daily paper wasn’t a bad point in time to use as a marker. I took the date from here. 3. I’m looking at i (or do we call it ipaper?). It was free this morning from Starbucks. This is the front cover. 4. According to the newspaper sat next to me he’s President of the Liberal Democrats. I wouldn’t have known that had I been tested (even after reading the paper). I just picked it as a random name ‘in the news’. Justin Bieber was 2 hours late for his gig last night. This has made national news. On real news channels.